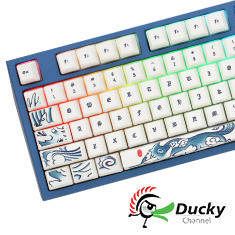 Ducky Year of the Dog limited edition mechanical keyboard. 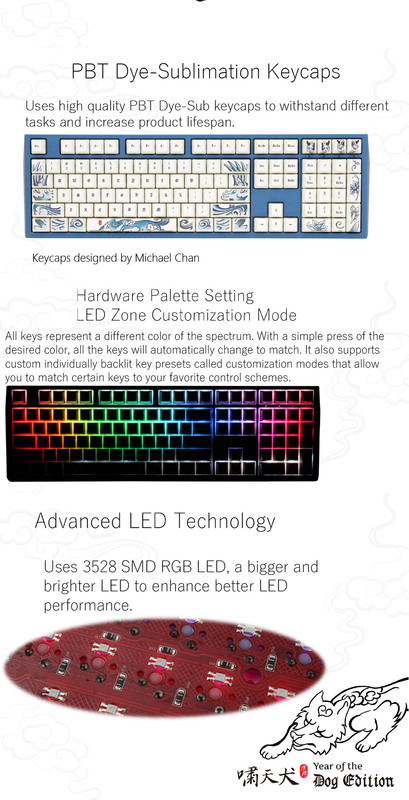 It features the quality components you've come to expect from Ducky, including Cherry MX Blue switches, PBT Dye-Sublimation tattoo keycaps, advanced RGB backlighting, a dynamic cutting edge Zinc alloy design with two tone colour scheme, Ducky Macro 2.0, Dual layer PCB, 3528 SMD RGB LED for bigger and brighter colour and Ducky’s exclusive reactive mode and LED zone customisation mode. Each keyboard has its individual number laser engraved, limited to only 2018 pieces worldwide. Backed by a 1 year Ducky warranty.